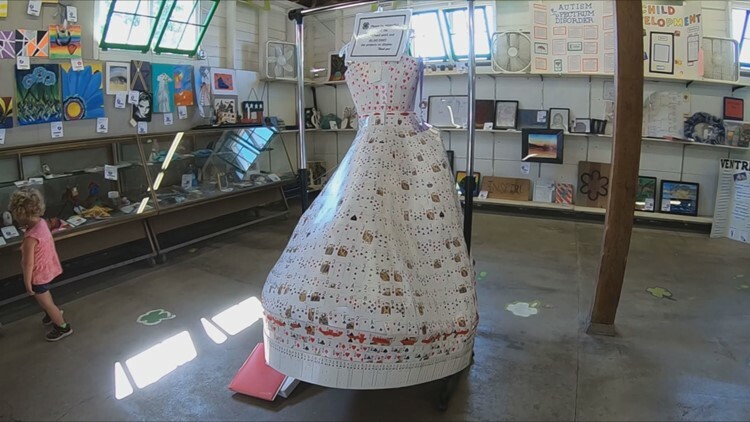 The playing card dress is the work of 16-year-old Staci Jo Sundblad, a 4-H'er and budding designer from nearby Mayer who has parlayed an idea she first saw on a creative website into a winning hand. WACONIA, Minn. - County fairs are not usually the best place for debuting formal wear. Too much dust, animal smells, you know. But inside the 4-H building on the Carver County Fairgrounds visitors are buzzing over a ball gown that is unlike anything they have ever seen. It is the work of 16-year-old Staci Jo Sundblad, a 4-H'er and budding designer from nearby Mayer who has parlayed an idea she first saw on a creative website into a winning hand. The dress is made from donated decks of cards attached to a garment she bought at Goodwill for $7. "I was scrolling through pinterest and I saw a dress that looked like it, and I thought, ‘I’ve got to do this.’ It was slightly harder than I expected, but I knew it was going to be somewhat hard." When Staci Jo started the project she thought she could just staple the cards together, but found it lacked the proper structure. 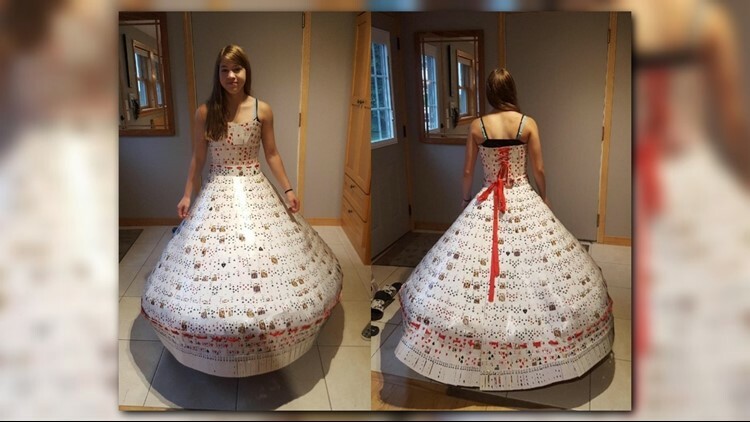 She then went out and bought the Goodwill dress to use as a skin, attached 40 decks of donated cards to the skin with more than 5,000 staples, and made laces using a hole punch and yarn. Most of the playing cards came from a casino via a friend of her grandmother's -- they're the slightly bigger ones that comprise the skirt. The rest (used for the bodice and the hem) were donated by family and friends, or purchased from Goodwill. "Forty decks of cards, but I probably used around 80 just from screwing up and having to start over," Staci Jo said. It's not just an art piece, either. Staci Jo took pictures modeling her card creation shortly after it was completed. Getting in wasn't easy, but do-able. "I have the back velcroed, so I un-velcro that, the corset part you just unstring that and climb in, sort of, to speak." Watching the reactions of fairgoers when they see her dress is fun, but it's not going to Staci Jo's head. "I don’t want to go up to people and say 'I did that' cause that’s boastful, but it’s kinda fun seeing people enjoy what I made," she said. There will be more attention to "deal" with in coming weeks, as the competition judges liked the dress as much as fairgoers. She won top honors in her category, meaning Staci Joe and her card creation will be headed to the State Fair for the 4-H finals. Well played, Staci Jo ... well played. Creativity, it seems is her strong "suit."